Archaeology often uncovers the unexpected, but it usually relates to activities which are hundreds if not thousands of years old, but last week we found something which is much more recent. 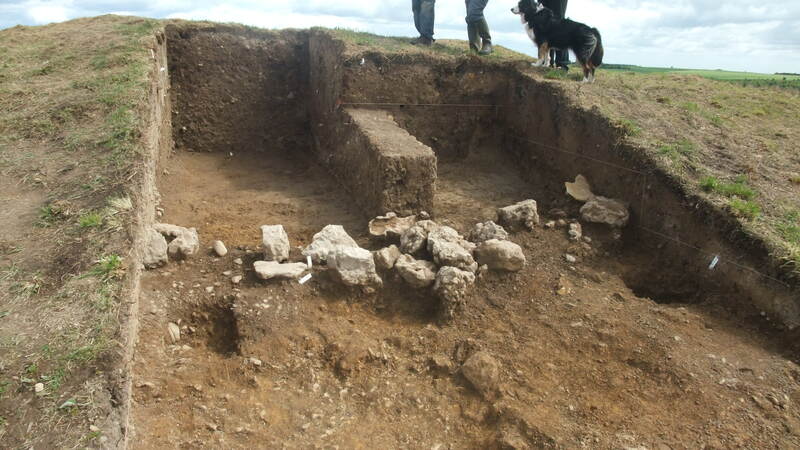 As part of our work under the Historic England funded Monument Management Scheme (Phase 3), we have been trying to improve the visibility and condition of a number of Bronze Age burial mounds (usually dating to around 1700-2000 BC) which have been obscured in recent years by the addition of modern cairns on top of them. Walkers who may be unaware of the ancient burial mound beneath a pile of stones are sometimes tempted to pull stones out of the prehistoric monument to add to the modern cairn on top and this causes damage the ancient fabric of the monument. 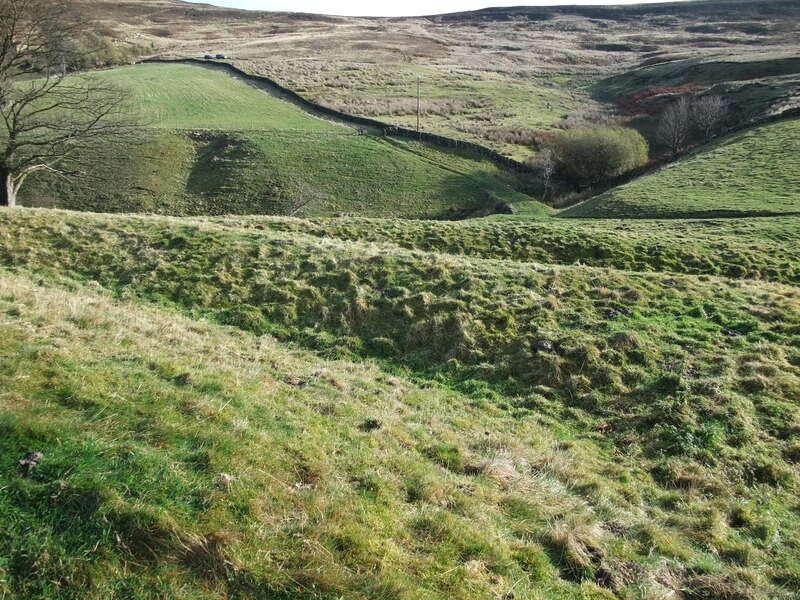 Many of these burial mounds are protected in law as Scheduled Monuments so it is especially important that we try to stop the damage and conserve what is left of them. Dismantling modern cairns from the top of these monuments can remove the temptation to extract stones for cairn building and restores the profile of the monument to something which is more recognisable as a Bronze Age burial mound. 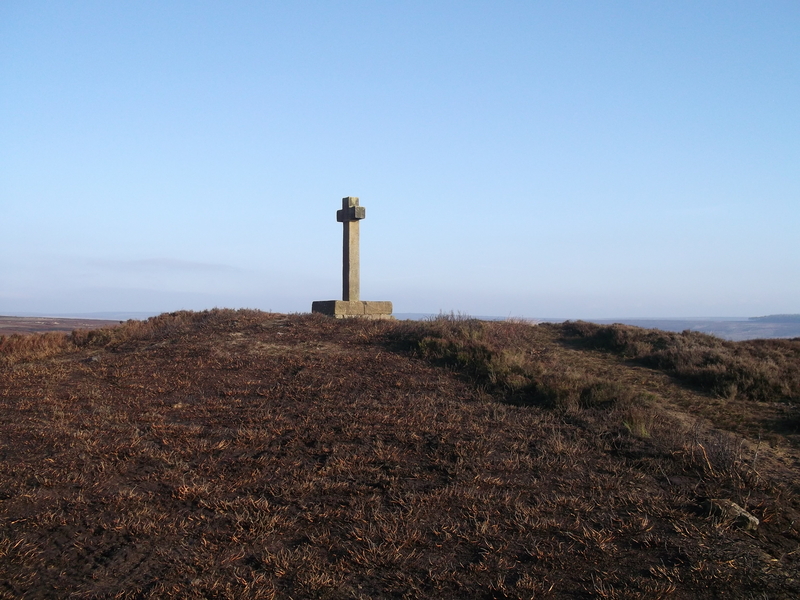 One such burial mound on Gisborough Moor is getting an improvement makeover at the moment. 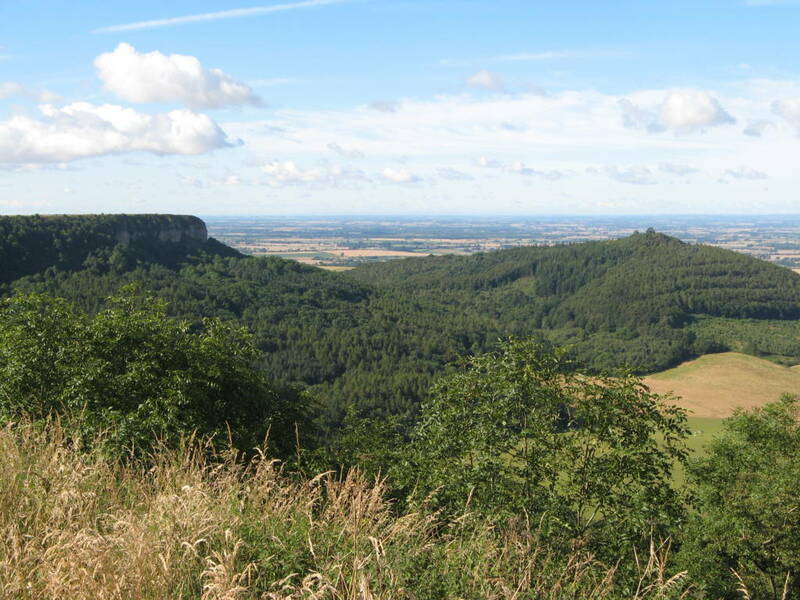 This is quite a low and not very imposing mound which is distinguished by having a rough kerb of low stones set into the ground around its perimeter and a larger earthfast stone – a stone slab set vertically into the ground – on its north side. Small standing stones like this are believed to be prehistoric and in this case to have been part of the structure of the burial mound. We organised an archaeological survey of the monument last autumn (carried out by Solstice Heritage) to be followed up, once the snows had gone, with the removal of the modern stones. 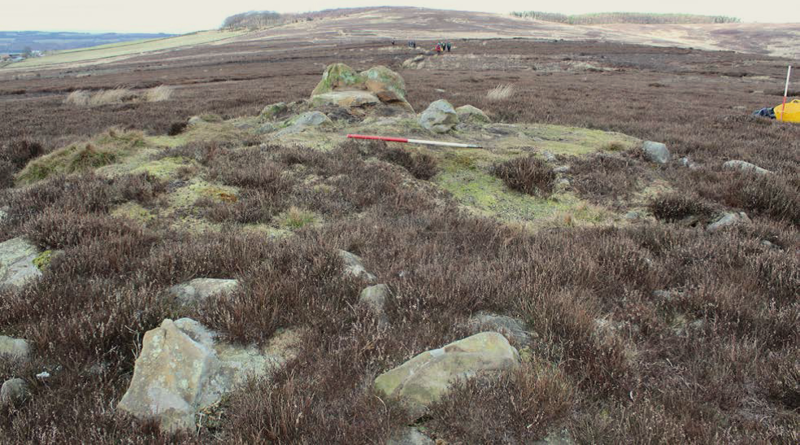 During the survey work we were intrigued by a lump of concrete which was visible, poking out from the bottom of the cairn. We were wondering how someone had managed to lift it onto the monument and in particular how we would be able to remove it. 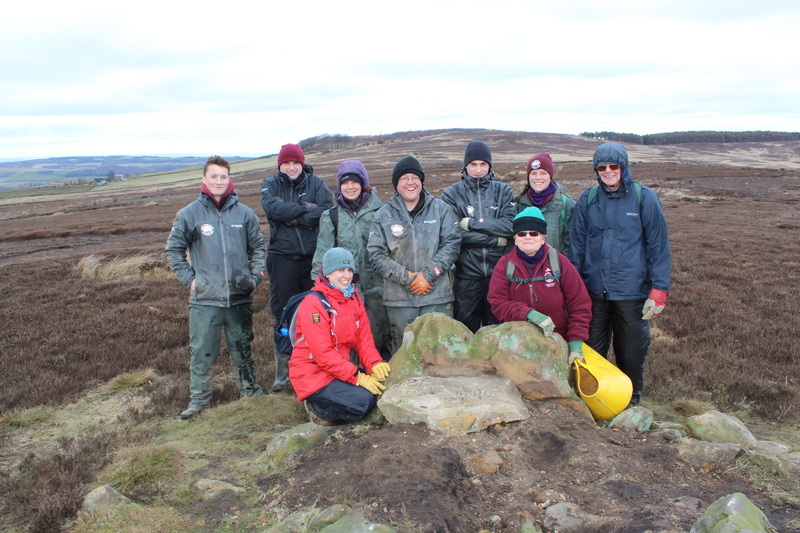 Come last week, a team of our volunteers and apprentices guided by Chris Scott from Solstice Heritage took down the modern cairn, taking care to inspect the stones for any signs of prehistoric decoration. None were found, but underneath the modern accumulation of stones, the lump of concrete turned out to be much more interesting than we had originally thought. Above: Modern cairn on top of the burial mound: the standing stone is at the left hand side and you can just see the concrete block next to it. Marked in the top of the concrete were the initials ‘CS’ and ‘JP’ with the date 11/11/1943 and in the centre was a deep and narrow cylindrical hole. We think that the initials are those of the people who cast the block and that it may have been intended to take either a flagpole or a communications mast. We know that parts of the surrounding moorland were used during World War II as a bombing decoy site – an arrangement of controlled fires which would have been lit during an air raid to draw enemy bombers away from Middlesbrough – so the presence of concrete dating from this time is not surprising. The 11 November date suggests that it may have been installed as part of an Armistice Day commemoration: perhaps the servicemen manning the decoy site held a ceremony of remembrance for the dead of the previous world war. 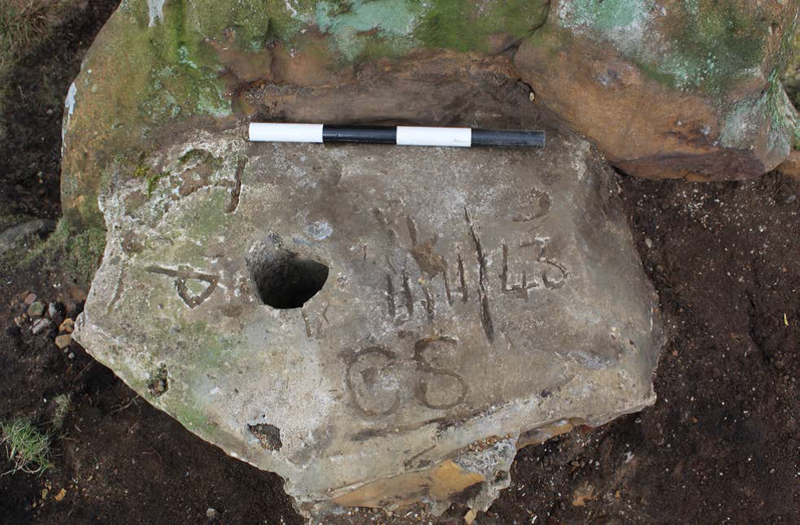 Although modern additions to prehistoric monuments often look out of place, in this case the World War II concrete slab is part of the history of this site and so it will be left in place to tell its own story. 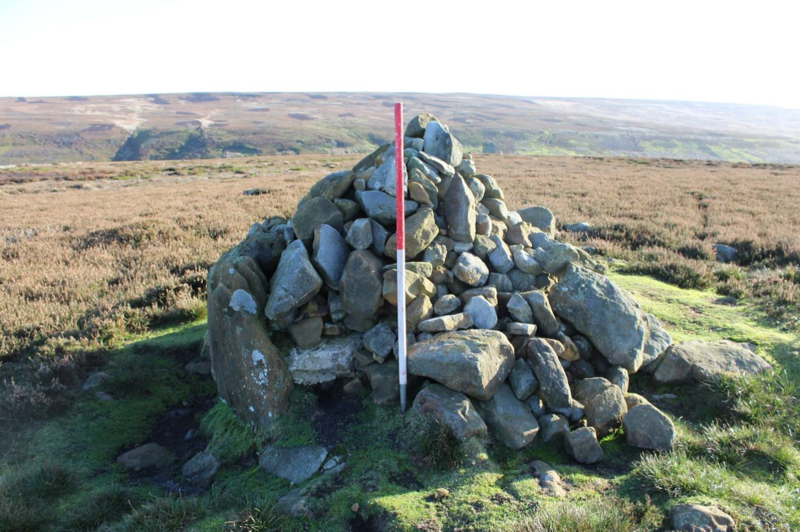 As for the Bronze Age burial mound – now that the modern cairn has gone, it is much easier to see the shape of the mound and the standing stone set within it as another visible part of the heritage of the North York Moors landscape and its much earlier past. 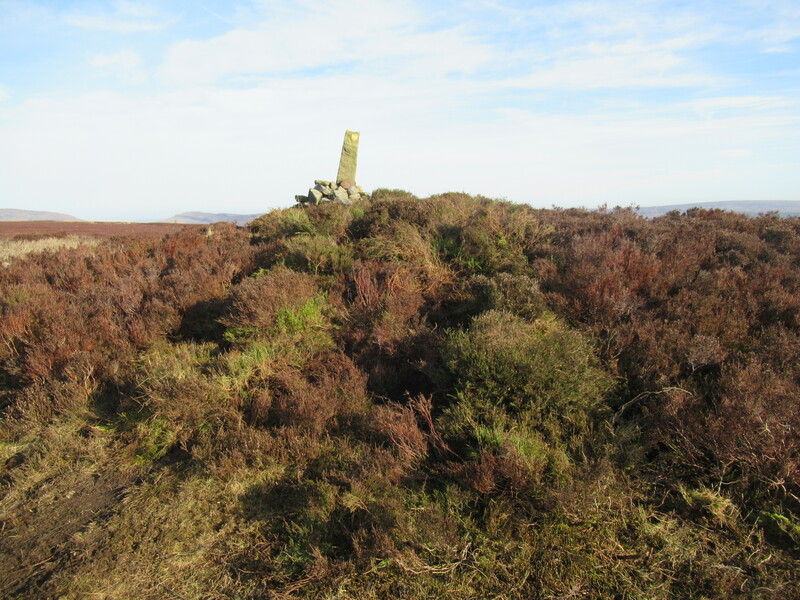 We will be keeping an eye on the monument over the coming months to see whether the vegetation is regenerating on the bare ground left by the removal of the modern cairn, and if necessary we will return later in the year to give it a helping hand. 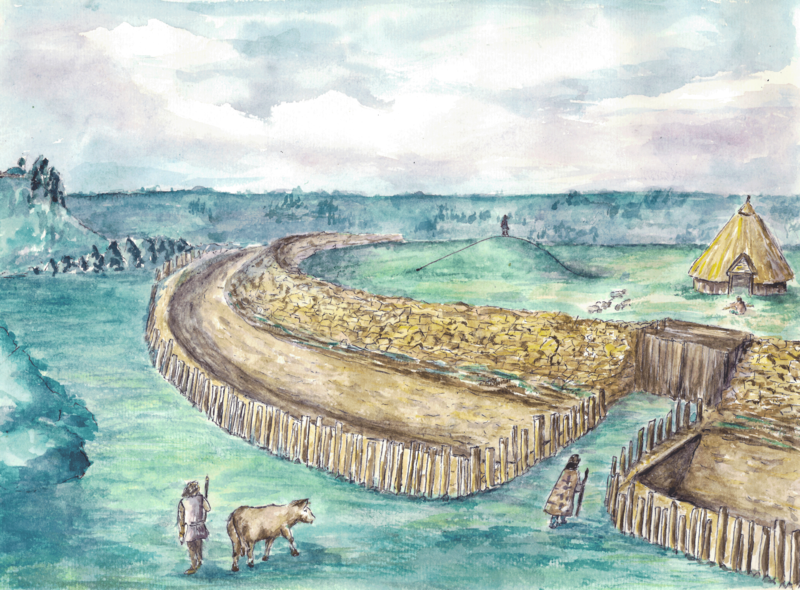 We will also watch out for the re-appearance of new cairns, but expect that this will be less likely to happen now that there are no loose stones on the surface – we would hope that visitors will respect both the prehistoric burial mound and the relic of our more recent past by not building any new cairns on the monument.